Compliance officers are professionals who ensure organizations and agencies are conforming to laws and regulations. As laws are becoming more complex and diversified, the need for compliance checks has become necessary. It is important that all organizations follow rules, work within legal boundaries, and adhere to laws. Not only does this ensures safety, but also reflects good governance. Laws have been designed for all kinds of industries such as healthcare, banking and finance, consumer manufacturing, and more. The role of a compliance officer has become more complex and in-demand. US News & World Report has ranked compliance officer jobs among the best occupations nowadays. Typically, a compliance officer specializes in a certain field according to his or her interest. For example, many compliance officers specialize in healthcare. Completing a bachelor degree is mandatory for any level of compliance officer career. You can earn a bachelor degree in fields such as accounting, business administration, legal studies, finance, and political science. Usually it takes four years to complete a bachelor-level program. However, the duration will depend upon the institute you choose for enrollment. A bachelor degree will prepare you for advanced studies ahead, or an entry-level career in the field. After completing your bachelor degree, you can enroll in a masters-level program. Graduate studies will help boost your skill set, equip you with advanced knowledge, and boost your career opportunities. The duration of a master’s degree is approximately two years, but may vary depending upon which school you enroll in. It is important that you have in-depth knowledge about the current laws, rules, and regulations. You can research in this field and broaden your knowledge base. There are plenty of learning resources you can choose from. Landing a compliance-related internship is one of the most important steps to becoming a compliance officer. Some institutes offer internships to their students. You can check with the prospective schools to see if they offer internship programs or not. Internships are considered an ideal way to get your career started and acquiring professional experience. It is recommended that you opt for internship programs in industries you plan to work in. It is not possible to become a compliance officer straight out of college. To reach this position, you must have at least 5 years of work experience. You can start off by pursuing entry-level or specialist level jobs in the field of compliance. You will acquire practical experience and will understand the legal and regulatory workings of the industry. O Net Online has revealed statistical data regarding the income and growth rate of compliance officers. In 2013, compliance officers made a median annual wage of $64,340. The exact level of income one may be eligible for will depend upon many factors such as state, industry, organization, qualification, and skill. A majority of compliance officers can be found working for government and finance industries. With a steady growth rate, the projected openings for compliance officers in the coming few years is 55,300. You can advance in the field and look forward to executive-level jobs by acquiring work experience, credentials, and skills. Many individuals move on to chief compliance officer jobs after working in an industry for a certain time period. How long does it take to become a compliance officer? To become a compliance officer, you will need to complete a bachelor’s degree in accounting, finance or a related field. This would take you four years to complete. You may also opt for voluntary certification after completing your degree. What are the requirements to become a compliance officer? To become a compliance officer, you will need to obtain a bachelor’s degree and complete courses in accounting, business administration, finance, mathematics and statistics. Following this, you will need to work as a compliance officer in any kind of financial institution, including investment banks, international banks or trust companies. You can also choose to get certified as a career advancement move. How much can I make as a compliance officer? According to the Bureau of Labor Statistics, the median annual wage for compliance officers was $67,870, as of May 2017. Q:What are the roles of a compliance officer? A:Compliance officers ensure that a company's product sticks to its and state and federal regulations. If they think that regulations are not being followed, then they conduct investigations or audits to ensure they are being followed. Q:What duties will I have to do in my compliance officer career? A:The jobs assigned to a compliance officer initially depend on the level of qualifications and experience of the officer. However, most positions require individuals to review and evaluate the compliance issues of the firm. This is done by overlooking that all members of the company, including the board of directors are adhering to the rules and regulations of the company as outlined by policies. Q:How to become a compliance officer in the healthcare industry? A:Compliance officers are professionals who make sure corporations and industries are following guidelines and laws. These officers can work in all kinds of industries including healthcare. To become a compliance officer, one must have at least a bachelor degree, and through understanding law and legal policies. For more information, browse through our page. Q:Can you tell me about the basic Compliance Officer Requirements? A:Compliance officers are professionals who ensure all organizations are following rules and regulations set by the federal government. All industries have compliance officers that monitor and regulate business activity. 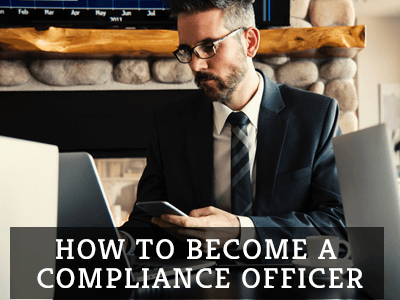 To become a compliance officer, one must have a bachelor degree in a relevant field such as business finance, management, law, or any other area. Q:How to Become a Compliance Officer in US? A:The first step to becoming a compliance officer is completing high school education and college education. You can pursue a bachelor and masters degree in relevant field such as finance or law. As a compliance officer, you will be expected to demonstrate knowledge about the field, and a strong skill set. Q:Are compliance officer careers hard to come by? A:According to the Bureau of Labor Statistics growth in this industry from 2010, which is the last time a study was undertaken, is expected to be 32%. In 2010, there were approximately 216,000 compliance officers in the US- the majority employed by the Federal Government. It is hard to specify how easy it will be to find work, as the answer will vary from individual to individual. Q:Are compliance officer jobs mainly based in one location? Or is there an opportunity to travel? A:Most compliance officer jobs would be based in an organization's head offices. However, that is not always the case. There may be a requirement to send you to a different location to carry out audit and other such activities. Depending on the size of the company you work for, your skills would be easily transferable to another location.